Word. I’m going to be on the radio tonight for the first time in a couple of months. Exciting! AND I get to talk about music instead of farting and Britney! (Much as I love farting and Britney this is a real privilege). 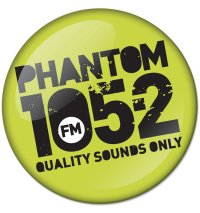 If you fancy tuning in, it’s State of Play from 7pm tonight on Phantom 105.2 (or http://www.phantom.ie if you’re outside Dublin). Wish me luck! Wow Louise, that is great news! I only saw it now so I missed the show but i hope that you get more gigs with that station, they are my favorite!!! Looking forward to getting that station when I move home to Offaly next week, could never get in Galway. Its great to hear you got back on the air….just we cant hear you that easily back down the Whhhhest!!! It was so sad to hear that you had gone from the old place and how quickly it happened. Your fans will be thrilled to hear you are back on the air and I know I will tune in as much as I can. Keep up the good work and keep us entertained!!! hope it went well, shall be keeping a vigor ear out for you on Dublin airwaves once I get back there!